Johnny Beckman is usually associated with the Original Celtics, but he actually had an outstanding ten year pro career behind him when he first joined the Celtics in 1921. Always among any league’s top scorers, Beckman saw duty in the New York State Basketball League, Interstate Basketball League , Eastern Basketball League and Pennsylvania State Basketball League during the teens. He led the 1915-16 Paterson and 1916-17 Bridgeport team to IBL titles. He added to his collection of championships as the star of the 1919-20 Nanticoke club that won the PSL title. Beckman also led the PSL in scoring during both the 1919-20 and 1920-21 seasons. Beckman consistently played over 150 games a season during his prime years from 1915 to 1925. He played on five teams in five different leagues during 1919-20 season in addition to countless games with independent teams. 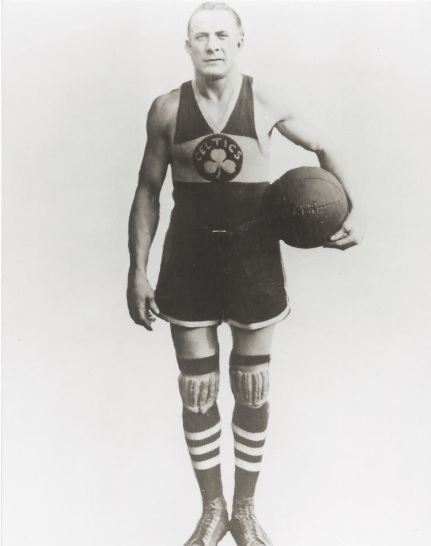 From 1921 through 1927, Beckman played with the Original Celtics. He and Nat Holman were the primary scorers on the famed team. Beckman was equally adept at long set shots and slashing drives to the basket. Beckman was a brilliant individual performer, but he was devoted to the Celtics’ principles of teamwork, passing and defense. In the middle of the 1926-27 season, Beckman was sold to the lowly Baltimore club in the American Basketball League where he became player-coach. He served in the same capacity in Detroit the following year until the club folded 18 games into the season. Beckman remained in the ABL through the 1929-30 season, but the huge number of games he had played finally took their toll. Rocked by injuries during the last years of his career, Beckman survived on guile and his always fierce determination to win. He was elected to the Basketball Hall of Fame in 1959.